I'm in a very unique relationship with someone who doesn't speak English (only understands it) and spends most of the day sleeping. Also, I don't think children will be possible for us and this bothers me. Could use some help if you would email me. Very interesting situation you have there. I am sure I can help. Can you give me some more information to aide in my advice? Where to begin . . . Her name is Trixy and she's been with me for a couple of years. I was excited at first to have the company, but I felt like it was such a one-sided relationship from the beginning. I am responsible for feeding and bathing her, etc. And that's fine. But I just hoped that she would want to spend more time with me in return. Instead, all she wants to do all day is play outside alone and then sleep inside, not in her bed, but like on the kitchen table. It really hit the fan over Halloween. I sewed us matching costumes as a surprise (we were going as the little boy and E.T.) and when it was time to head out, she ran and hid and wouldn't come out until Halloween was over. Any advice on how we can handle this would be great. it sounds like you are in an enabling situation. you shouldn't be taking care of her like that she is an adult. Is she handicapped? it sounds like she has depression. it is very difficult to be in a relationship with someone who has depression. you should seek help. No, she doesn't have a disability or depression. I think she's pretty typical, actually. Sometimes I feel inadequate. Like I'm not good looking enough for her. I don't know. I'm just having a really hard time here. It doesn't help that she doesn't even speak English. 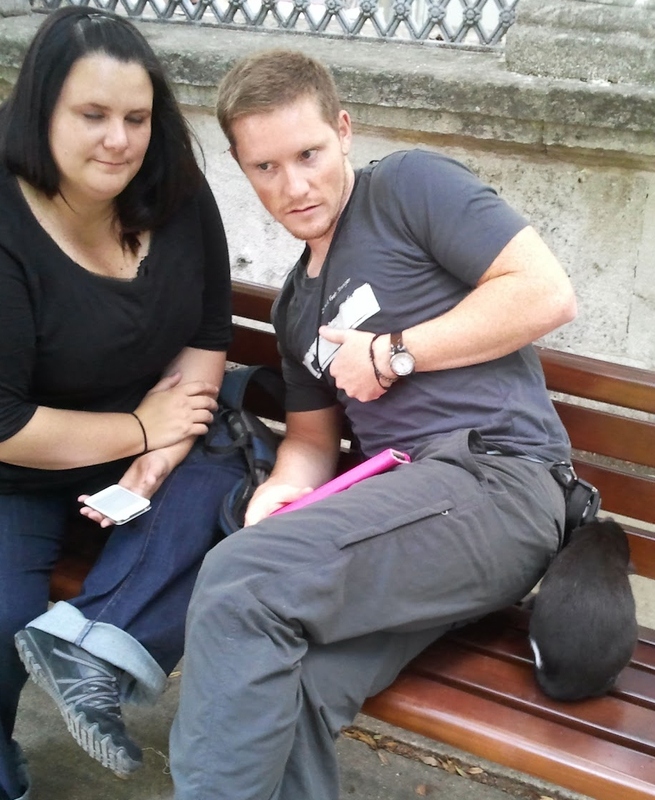 I have attached a picture of the two of us hanging out on a bench together. While Trixy is very beautiful, you should never tell yourself that you are not attractive enough for someone. in my relationships I always remind myself that I am a remarkable person. How do you communicate with Trixy if she doesn't speak English? that sounds like your main problem. You should avoid relationships in the first place if you dont even speak the same language. Well she understands English perfectly. She just doesn't speak it at all. I understand her when she speaks but in her language the vocabulary is very limited. You know how it is. She's also frequently adding other men as friends on Facebook and this really bothers me. It might be an accident because she has a hard time using the computer. But I just feel so second-class when she does it. That doesn't seem correct to me if she can understand english she should be able to speak. It seems like I am missing some information I should have to be able to help you more. Not sure what to say about the face book thing. she probably only adds losers anyway lol! Not to state the obvious . . . but I'm pretty sure Trixy is not the first cat in the history of the world to not be able to speak English very well. Are you saying Trixy is a cat? then who is that person in your picture? this has to be a joke right? your not in a relationship with a cat. Oh my gosh! Did I not explain that earlier!? No wonder you are so confused. The person in that picture is my sister. Trixy is the one on the far right. I'm done. I am an expert on human relationships not pets. One member of our organization told us recently that you are an expert on pet/owner relationships and that you might be interested in speaking at our Annual Summit. This year's topic is "Why Pets are Better than People." Could you prepare a 3 hour lecture on this by next Thursday? i can tell you how to improve your pet relationships. stop replacing the people in your life with animals! Ok. But do you think you could make that into a 3 hour lecture? Trixy Meowman wants to be freinds with you on Facebook. Would you like to confirm this request? nice try. this isn't even from Facebook. its a gmail account. I think you're my hero in life. more more more more more!!! Give me more blogs to read with Messing with People!!! You have a disease. It's called The Awesome. A hairball reference would have been icing on the cake. Ha! You make me smile. I have got to stop reading your blog at work - there is NO way to muffle my laughter. I want to be you when I grow up. Everything here is exactly what the doctor ordered if you ask me! Love this blog! The picture did it for me. No chance of my coworkers not noticing that I'm not working. You are awesome, thanks for the laugh! This guy takes himself too seriously. He really needs to laugh more. This comment makes me sad. Don't get me wrong, I cackled while reading the blog. But I don't think the poor fellow has a lacking sense of humor; more than likely it felt to him like unwelcome mockery. In any case, Eli, you're terrible for what you do and I'm terrible for damn near peeing my pants every time you post something new. Eh. I really don't think Eli is mean. Just obnoxious. Like in the way a little brother is obnoxious. He doesn't really insult people or try to make them feel bad---he just pesters them. And it's so freaking funny when he does. "This isn't even from Facebook. This is a gmail account." Hahahahahaha! I was just thinking the same thing! It was like his gotchya moment! Rude. If he didn't specify "human relationships" on his blog, he has no right to discriminate. Best part: "I understand her when she speaks but in her language the vocabulary is very limited. You know how it is." You are my HERO. Gosh, I about pee my pants every time I read these!! I nearly cracked up laughing when I should be working. MORE MORE MORE on messing with people posts!!!!! MORE!!! "in my relationships I always remind myself that I am a remarkable person."